Laughter Yoga combines interactive laughter exercises with deep centering breaths and calming movements. It is based on scientific studies that show that the body can not tell the difference between "real" or "fake" laughter, you get the same health benefits to your body and mind. 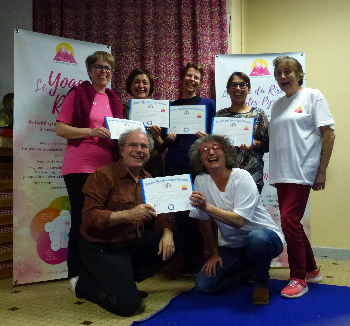 Laughter Yoga is simply bringing people together as a group with belly laughs, belly breaths and light playful movement. It can be performed gently (in a chair if needed) or standing and moving throughout the room with full energy and enthusiasm! All Laughter Yoga movements can be adapted for EVERY BODY! No yoga mats or flexibility needed! 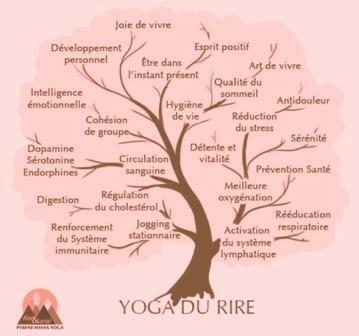 Robert Rivest's Laughter Yoga programs for health, wellness and stress relief help people of all ages feel healthier, happier, and have much more energy! How does it work? Laughter is initiated in a group with full body laughter exercises, clapping, eye contact and youthful playfulness. The "simulated" laughter soon turns into real and contagious laughter that brings more oxygen to our body and brain, lifting our spirits and carrying over into our work, school and everyday lives. In 1995 Dr. Madan Kataria, a Physician from Mumbai, India, launched the first Laughter Club with merely a handful of people. Today, it has become a worldwide phenomenon with more than 6000 Social Laughter Clubs in over 60 countries. Laughter Yoga is based on a scientific fact that the body cannot differentiate between laughter exercises and real laughter. Anyone can Laugh for No Reason, without relying on humor, jokes or comedy and get the same physiological and psychological benefits (boosts immune system, releases endorphins, increases oxygen intake, decreases stress hormones, creates a joyful connection with others, and enables you to laugh more easily at life's travails)."